I've been absent. Both the thesis and preparing an exhibition and a lecture about my travels in 2009 have kept me pretty busy. 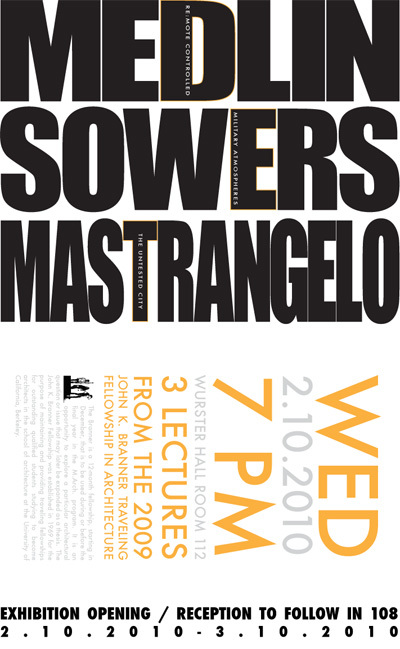 If you are in the Bay Area, I hope you can come out to hear a talk that I will be giving this Wednesday titled "Military Atmospheres" in conjunction with the other two Branner Fellows. There will be wine and refreshments in the exhibition opening which immediately follows the lecture. For those of us not in the Bay area you should get it on video and post it on YouTube. I think that will be happening!